‘DYNAMIC DUO’ An expert panel discusses opportunities of pursuing CTE and apprenticeships. 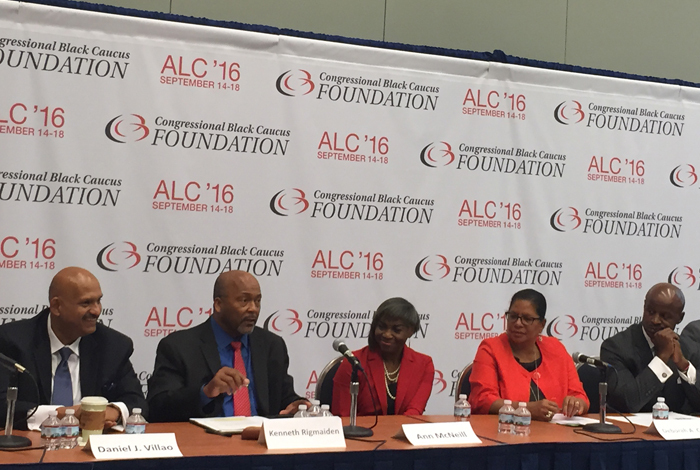 Apprenticeships and career and technical education are nontraditional pathways to career success, ones oftentimes overlooked by African Americans because of lingering stigmas, according to an expert panel during the Congressional Black Caucus Foundation’s 46th Annual Legislative Conference. That’s a key message that emerged during a Sept. 16 issue forum hosted by the Augustus F. Hawkins Foundation. Apprenticeships can be an alternative to college,” said Deborah Carroll, director of the District of Columbia Department of Employment Services, emphasizing the importance of introducing youth to the full spectrum of opportunities when making their career path decisions. Today’s apprenticeship programs embody more than the well-known hands-on element found in skilled trades, according to Kenneth Rigmaiden, general president with the International Union of Painters and Allied Trades. “To anyone who’s curious about an apprenticeship program, I don’t want them to think that it’s just strong arms, strong back and just go out and get the job done,” said Rigmaiden. Oftentimes a discussion of apprenticeship programs focuses on training in areas such as carpentry or electrical, among the skilled trades under the umbrella of career and technical education. But that is changing. With advancements in technology, industry experts point to a rebranding of CTE to include science, technology, engineering and math education, or STEM. Rigmaiden noted that there’s an alignment between apprenticeship, opportunity and STEM. And a place where the wage gap issue is non-existent? Registered apprenticeships, according to Daniel Villao, deputy administrator at the U.S. Department of Labor’s Office of Apprenticeship, because “registered apprenticeship is a level playing field” regardless of a worker’s race or gender. When it comes to CTE, one of the biggest misconceptions is that it only includes the traditional approach to construction. “This is not just shovel and screwdriver work,” said Villao, noting that this work is very technically advanced. A worker can walk into a building with an iPad and download blueprints, he added. Meanwhile, Terry Riley, a former Kansas City Council member in Missouri and president of the consulting firm Transformation Consultants, called for the education of elected officials to “get beyond the rhetoric” when it comes to getting people back to work in communities. As an example, Riley cited a project where workforce development included partnership with building trades and union outreach. Across the panel, there was a consensus of the need to increase awareness about the benefits and opportunities within apprenticeships, and through a pursuit of career and technical education. A lack of knowledge, said one expert, is among the biggest hurdles impacting apprenticeships.